Like all materials that boats are built with, steel has its pros and cons; unfortunately, after working on mine for four months in a boatyard in Grenada I have to say I am having difficulty finding the former. This picture is after most of the work had been completed and she passes my 50ft rule. That is if I can look at her from that distance and she looks alright then it’s time launch. I’m not irresponsible or reckless; it’s just if you wait till she looks perfect you will never leave. That’s my excuse anyway. 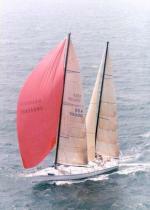 They tend to cry a lot - or that is how a friend of mine described it when I left her in the boatyard for some while. What he meant by that was the streaks of rust that ran down the topsides. Now I must admit I have a wooden rubbing strake which is a no-no. Wood and steel just don’t go together especially if you don’t keep it varnished (the wood that is) - and this is a full time job on its own in hot climates. The wood takes up moisture, which then finds its way under the paint between it and the steel. The steel then rusts and expands causing the wood to crack and therefore more rust and those ugly brown tears. Maybe someone could invent a rust coloured paint. This may not be very attractive but would save a fortune in Phosphoric Acid. Have you ever had a leak from, say, a hatch or a porthole that drips when it drizzles but you can have green seas go over it and it is as dry as a bone? Well they’re the leaks that bite you in the hull! 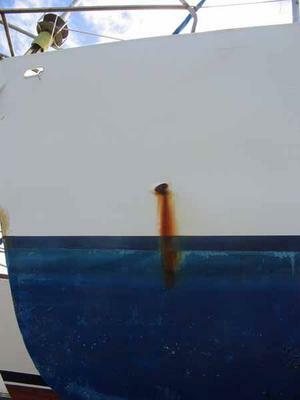 Even if a boat has been painted, coated or what precautions have been taken when she was built or overhauled sooner or later it seems water will get trapped somewhere. Against a bulkhead, by a rib, chain locker or in what is supposed to be a dry bilge - and that’s just the places that you can access. There are the places under the sole or behind the linings that fester away just waiting for you to disturb them with your chipping hammer. I've often heard the argument that steel boats are easy to repair. Well if you didn’t have a steel boat it wouldn’t rust and therefore you wouldn’t have to repair it in the first place - and as for it being easy, that depends on numerous things of which these are just a few. Where on the boat is the rust? Is it accessable from the inside, or have you got to remove half the interior to effect a proper repair? How much of the coverings, coatings, wood etc can stand the temperatures that are produced when welding? This is OK when the problem is in the bilge or other places that have no combustable materials, but near plastic pipes, or with electrical cable too close, this can be a nightmare. Melt the insulation on a on a cable and the long term effects on the hull could be more destructive than the rust its self. We are then talking ELECTROLYSIS, the other scurge of steel boats. So there you are the floor taken up, the wooden bulkhead removed, the insulation cut back, with a hand full of pipes and cable. With a bucket of water handy, you attack the infested area with an angle-grinder. Well you thought it was just that SMALL area, but alas you find a little bit more nearby. It’s decision time. 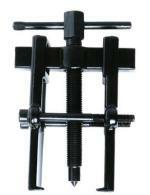 Do you cut out a seperate hole around this new dicovery or just make one big hole? Time for a beer and a discussion with everyone in the yard about what to do. On returning to the boat you usually find you are much more relaxed about the ‘HOLE’ thing, and things go much more smoothly. I’m just speaking for myself you understand, I wouldn’t recomend this course of action for everybody and I don’t want to be banned from every boatyard by health and safety. 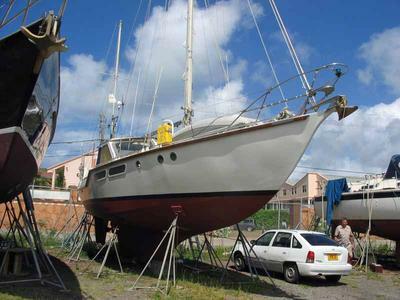 (That’s a joke if you have ever been in a boatyard in the Caribbean)and while I’m about it, make sure you have no fibreglass boats near at hand as the owners tend to get a bit irate when their pride and joy looks like it has been pebble-dashed. Now you’ve cut out gaping voids in the hull, prepared the pieces of metal to be welded in, put on your fire retarding clothing so you look a formula one driver in his underwear and are laying in a puddle under the boat with the temperature at 90deg (Caribbean again).This is a piece of cake you think until a piece of molten metal manages to fall on the only bit of bare skin you left uncovered. Then the rod sticks to the boat and somebody walks past and wants a chat. When all is finally welded into place, and you go to meet fellow boaters in the nearest bar they tend to deflate your mood by asking silly questions like ‘have you tested the rest of the boat, as you know where there is some rust, there could also be more elsewhere’. You of course know that, but are in denial and if you stay there long enough you won’t care anyway, but as you sober up those ‘Blues’ start to return and you end up sounding like the boatyard ‘STEEL PECKER’as you try and find more places to cut holes. First thing is never fit alluminium cleats or any other fittings to your steel deck (as was done with mine), even if you insulate between the surfaces because the bolts are made of stainless and the cleats disintigrate. And as steel is such a good conductor you end up as the electrical earth for most of the stray current around in the water, especially in marinas. 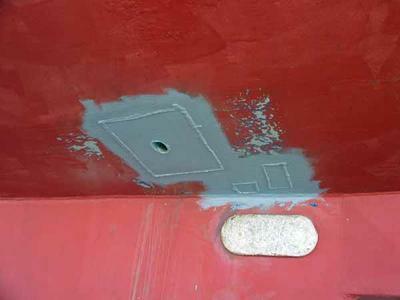 And thats if you manage to prevent the internal earth leaks on the boat.The only answer is to have very large sacrificial anodes, that double as additional ballast. Finishing on an up note so as not to convince people they should never buy one, steel boats are very resilient to reefs and rocks. So if you do manage to hit one of these and make a hole, then as long as you have a sheet of steel , a welding machine, and a power supply big enough to run it you’re laughing. Just the sort of thing you find on a deserted atol. And another very important attribute that a steel boat has over other types of constrution is that if by any chance you get struck by lightning, as long as you stay inside the shrouds you’re safe, thanks to the Faraday Cage. The trouble is the boat probably becomes magnetic which is very confusing for the compass and you run into one of those reefs we mentioned earlier. Would I have a fibreglass boat instead of steel? Probably, but in the meantime I’ll remain a glutton for punishment and stick with my steel one. I have a steel boat a 30 footer in my drive way took it home from the boat yard. I had to pull it down to the bones and put half a new bottom on it. It is not about the money, its about the journey I am having rebuilding her. one more year and I will be done. If you start a rebuild look at two years of your life going in to the boat. Never let some one tell you it is not worth doing. I hope you enjoy your steel boat too. You shouldn't have much trouble with your SSB radio reception either; your steel boat is just one big ground plate.